Hello! Yes, I know it has been awhile. Things have been a little crazy in my world this summer, some good and some bad. On the good side, I spent a couple of weeks touring Norway and Scotland which was amazing. On the bad side, we lost my father to cancer. We had a while to prepare, but it left me with not much inspiration to knit other than some mittens for charity. I did want to give you all something new for this holiday season, so I’ve circled back to a project I’ve been working on since last year. If you did my Wee Winter Woolens set last year, you may remember it ended with a polar bear sweater. 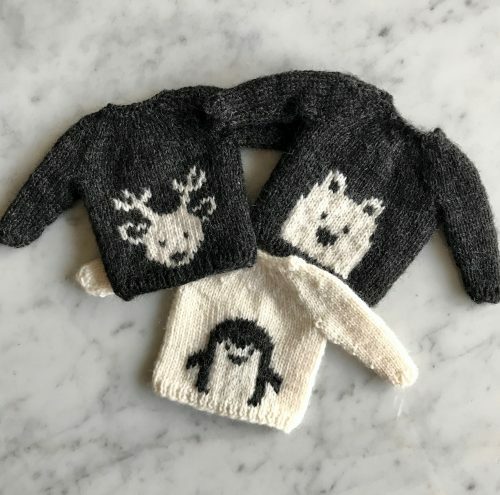 This year we’ll be creating a set of wee sweaters with animals on them, a polar bear, a penguin, a deer, an arctic fox, an owl, and a rabbit. Here is a peek at three of them. Today you can download the written pattern and first chart here for free. Then for the next five Mondays, I will release a new chart. For those of you who prefer to have the pattern in Ravelry, the whole set is available today as a single pdf for $2.50 here. (Yes, you will get the whole set at once instead of in weekly installments.) People who buy the set on Ravelry will also get a bonus sheep chart (which I think would make a great present for your fiber friends). Wondering what to do with these wee sweaters? They’d look cute as Christmas ornaments, you can even get little doll-sized hangers. Mount and frame them for a cute piece of wall art. String them together as a garland. You could add more pieces from the Wee Winter Woolens set to make it longer or do some plain or striped sweaters. Display them on a wreath. Use them to top presents. As always feel free to ask questions and share photos in my Ravelry group.